Main Characters: Dorothy, Scarecrow, Tinwoodman and the Cowardly Lion. Description of one of the main characters : Dorothy is a small kind-hearted girl who shares everything willingly. Whom I like and why: I like the Scarecrow as it helped Dorothy till she reached back to Kansas in the Prairies. Whom I dislike and why: I dislike 'The Wizard of Oz' as he cheated the people saying that he was a wizard but he was a normal man from Kansas. 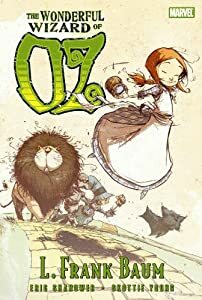 Setting/Theme of the story: Dorothy got carried away to the magical land of Oz by a storm and made friends with Scarecrow, Tinwoodman and Cowardly Lion. Her friends helped her on her way to the Emerald city. Finally she got back to Kansas with the help of a pair of magical slippers. Part I enjoyed the most: When Dorothy killed the 'Wicked Witch Of The West' by pouring water which melted the Witch and released her slaves. Different ending: Dorothy could not get back to Kansas. She felt bad. She stayed with the Scarecrow in the Royal Palace of the Emerald City. In time, she becomes the queen and ruled wisely. Very good. Welcome to the world of blogging.